Pain is real. There's no denying it. You can pretend for only so long that it doesn't exist until somehow the scab gets scraped off and you're oozing and inflamed all over again. But we don't have to become our pain. We can acknowledge it, cry it, write it, dance it, stomp it, paint it, draw it, talk it, sing it, see it, get it, love it and let it be until the storm passes through. If we welcome our pain, rather than suppress it or throw it onto another person to fix or feel responsible for, we actually have a shot at releasing it. But we give our power away every time we make someone or something else responsible for changing it inside of us. Releasing pain starts by shifting our attention away from the ‘universe’ of other people, places or things responsible for it and putting the focus on our 'innerverse', the world inside ourselves where experiences, emotions, beliefs, thought patterns and realities are born. Learning how to discharge from feeling filled up with pain, whether emotional or physical, is a difficult task. If it were easy, there wouldn't be so much bullying, break ups and abuse of drugs, alcohol or food to numb the discomfort. But pain, just like the water molecule, can and will find a way to transmute and evaporate. Pain can change, as soon as we realize that it shows up for a good reason; and that reason is not just to torture us. It's to teach us, shape us and awaken us to the potential for a course correction, which can be made at any time. Think of a fever. We usually freak out when we get fevers because they mean we're really sick, but in actuality, fevers signify the healing process already under way. Fevers, or an increase in white blood cells, are the body's first defense at ridding itself from unwelcome disease. Emotional and even physical pain is the way our bodies (and hearts) tell us, “Pay attention to me. See me and understand me. Witness me and get curious about why I showed up here, and then I can be on my way." It's really only when we keep denying it or believing we're truly oppressed by the pain that it shows up over and over again to teach us differently. When a baby is crying, will he stop if you yell at him or tell him it's inappropriate? No! When a baby is crying, we pick him up, swaddle him tight, and hold him close so he feels our warmth and intuits a sense of peace and protection. Then, if the baby doesn't stop crying, it's time to get curious so we can figure out what might be bothering him and why. Well guess what?! We're all still babies inside. And our emotions make us feel infantile instantaneously. You don't have to pretend this isn't so. Instead, you can learn to embrace yourself like a proper parent would. Relief from our pain comes from having done our duty to acknowledge, honor and witness our wounds, sending a salving, compassionate message of love to them without needing things to change instantaneously for us to find relief. 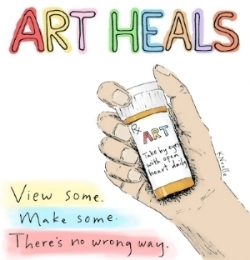 Art is one of the best therapies for pain. It functions like a diplomat on behalf of the subjectivity and authenticity of pain, creating bridges through imagination to the world of relatability and re-connection to joy. It is a safe haven for volatility and rage because it provides an outlet for the parts of us needing safe self-expression where there are no devastating repercussions for what we’ve shared. Art, like a fever, is one of the fastest ways to transmute heavy to light or wrong to right. The disconnection that can occur between what we feel and how we share it is broken when we allow art to be our intention of growth and expression. In the creation of art, (good or bad), I've never known a single person who didn't feel better in the process. Let yourself imagine today that you could transmute your troubles into a picture or a painting. What would that look like? If you have the time, sit down and let yourself draw it out.